Procession of the pink plastic table to its new home in the antenatal clinic. You might think that this is a cheap plastic table with some laminated cards tied on with pieces of string. You wouldn’t be wrong about that. 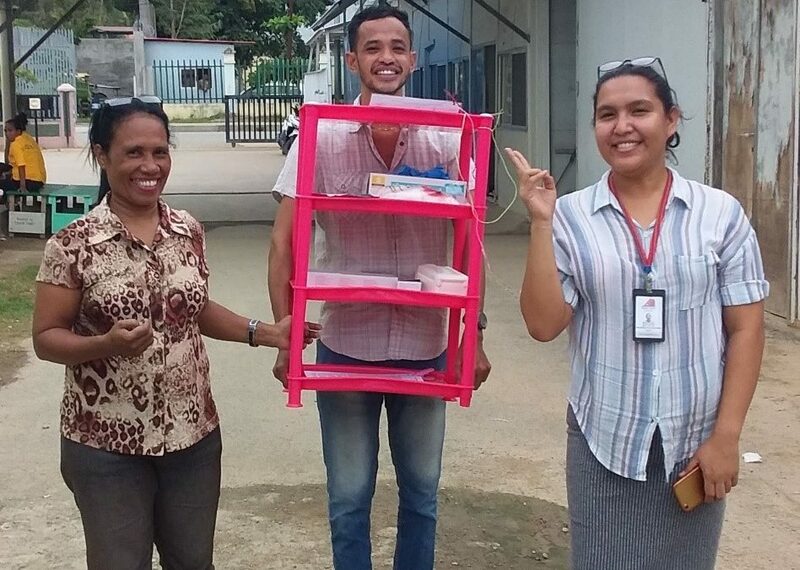 What might not be obvious to a casual observer is that this fluorescent pink creation will help protect Timorese babies from being infected with HIV. Our main laboratory is open from 8am til 5.30pm. But babies don’t always time their arrival to coincide with business hours. Until now, a woman arriving in labour on a Friday night would be likely to go home on the Saturday with no HIV test at all. In the photo, Ano is carrying a pack of 10 test strips on the top shelf of the pink table. Nina and Madalena have written out instructions for doing the test in Tetun. Every test has the potential to save the life of the pregnant mum, the life of her baby, and potentially the lives of other children at home. Plus, identifying HIV in the mother can help protect her partner from infection. That’s a lot of lives for one tiny test, a few drops of blood, and 15 minutes. I’d be happier if I could give the midwives a healthier quantity of test strips to be going on with, but the erratic nature of the supply chain means that our stocks are running low again this month. 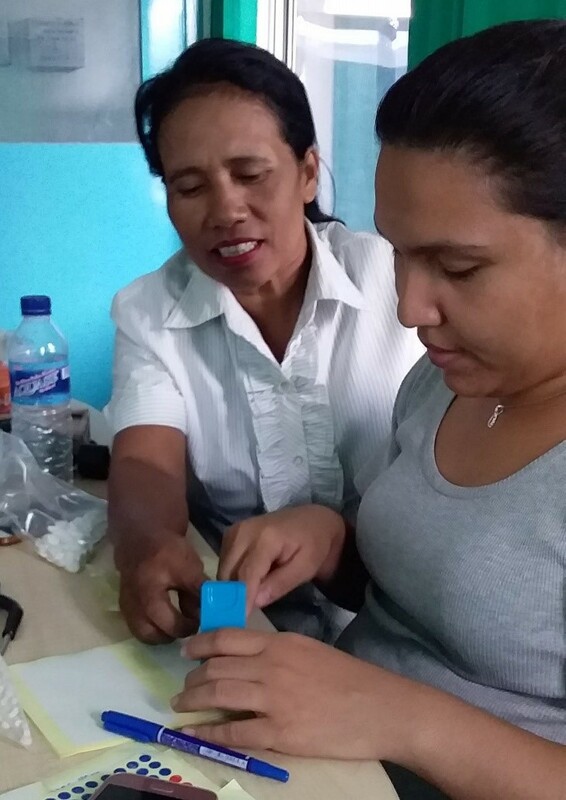 At the current time, most women in Timor Leste miss out on having an HIV test during pregnancy. Maybe they live too far away, and transport to the antenatal clinic is too expensive. Maybe they make it to the clinic but nobody remembered to do the test – or they had no tests in stock that week. I’ve met many women in Timor Leste who have been diagnosed with HIV as part of screening in pregnancy. These women have had the HIV test this pregnancy… but weren’t tested during their earlier pregnancies. Nearly all of them describe more than one baby dying mysteriously within the first year after birth. For one of our newly diagnosed mums we found that two of her young children at home had HIV, unsuspected until now. Now that they’re on treatment with us hopefully they will do okay. Donated plastic pill cutters from Australia – worth their weight in gold! There are particular challenges involved with treating HIV positive children here, including a severe lack of paediatric drug formulations. This is a problem that sees me frowning furiously over a calculator, attempting to work out whether one tablet cut into quarters will be close enough to the proper dose. We hope we will be able to access adequate drugs for our HIV positive children one day. But our preferred solution is to have no more children being infected with HIV! Hence, the beginning of our collaboration with our colleagues in Maternity. 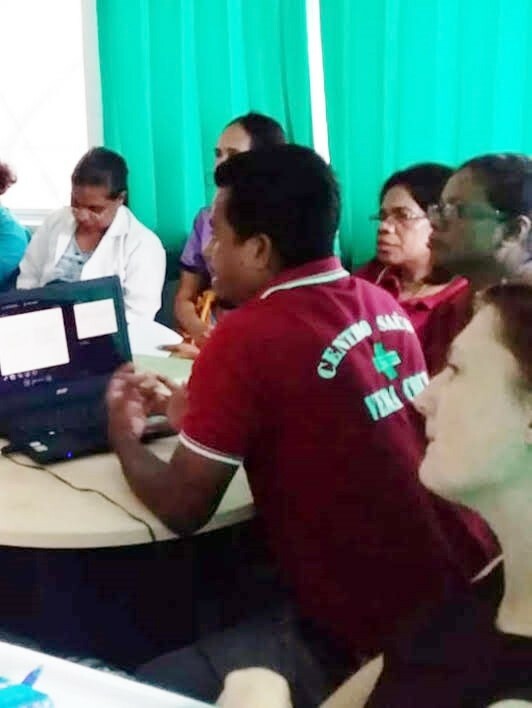 The first training session with the midwives was conducted by Dr Alfredo, sharing information on mother-to-child transmission of HIV and how we plan to prevent it. Now equipped with their fully-loaded pink table, the midwives will be able perform HIV testing themselves – at any hour of the day or night!